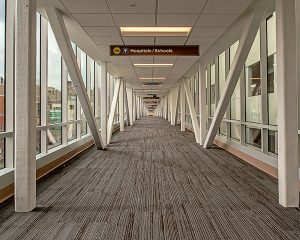 BJC Connector Bridge | Healthcare and Life Sciences | PARIC Corp.
PARIC completed a 1,200 sq.ft. concrete bridge for BJC Healthcare and Washington University Medical Center. The bridge was built in four separate phases and connects four different parking garages directly outside of the hospital. The connecting bridge was constructed largely at night so as not to not disrupt the flow of traffic. The pedestrian connector is 13-feet wide and is elevated 40 feet above street level. The connector bridge drastically improves the convenience and efficiency for staff and students dealing with traffic and parking in one of the busiest locations in St. Louis. The enclosed walkway requires key card access which allows pedestrians to travel to work and class in a safe, secure environment.